Fire was always a recurring and terrible concern for householders throughout Britain. This was because houses were frequently timber framed, usually thatched and often very close together. Presumably this fear was aggravated by events like the Great Fire of London in 1666 which demonstrated so clearly how fast fire travels and the scale of the damage it could cause. In Thornbury we have found that many documents, including wills and house deeds, refer to past disasters caused by fire. John Gayner the elder‘s will of 1726 for example mentioned “all those my three burnt houses in Thornbury adjoining together” that were purchased from George Pearce. George Pearce was a blacksmith and we feel that may well have been the reason for the fire. Rosemount at 66 High Street was partly built on a “plot of ground where a messuage formerly stood but since burnt down.” However there were very many others. In Thornbury one house, 48 High Street, still displays an interesting fire mark showing it was insured by the Sun Fire Assurance Company. We do not know yet know who would have been responsible for putting out a fire in this property should one have occurred about that time. There wasn’t an organised “fire brigade” in Thornbury at this time and we can only assume that the fire mark served to encourage volunteers to help put out the fire as it was an indication that they would be rewarded by the insurance company. It was certainly important to have one’s house insured against fire and home owners made many provisions for this. The deeds of houses often contain details of a mortgage arranged only if there was a valid fire insurance certificate. At least one will to our knowledge (that of Hester Bagnell of 1801) specified that the beneficiary could have a property for his/her life time provided it was insured against fire. Using the Fire Insurance Companies to provide fire services addressed some but by no means all of the difficulties in taking action to put out fires. The fire insurances companies had a problem finding the necessary volunteers, water and equipment to put out a fire. An insurance company only had a duty to the houses that were insured with that company. If a house adjoining an insured property was burning, it was a major threat to the policyholder. However in that situation the insurance company had no obligation to act until the insured property was actually alight. One newspaper article of 12th September 1891 explains how the fire insurance companies dealt with finding volunteers to put a fire out before any fire brigade existed in Thornbury. There was a fire in a hayrick adjoining the Saw Mill in Thornbury. Edmund Cullimore the owner of the saw mill who would have wanted to protect his own property made an insurance claim from the City of London Fire Office for the expense of extinguishing the fire. The insurance company allowed each man who assisted six pence per hour whilst so employed. Long after the local Councils accepted responsibility for putting out fires, the insurance companies were still paying for the fires to be extinguished. We have a newspaper report dated January 1913 that describes a serious fire at Prewett’s the printer and stationer in the High Street caused by a gas escape. The Council charged the insurance company the “regulation charges” – in this case three guineas – and the whole of this was paid to the fire brigade. Another report of 19th March 1938 says that the firemen had not been paid for the last three or four fires they had attended. This was because the fire insurance company was refusing to pay in cases where everything was destroyed. The firemen were unhappy and threatening to resign. 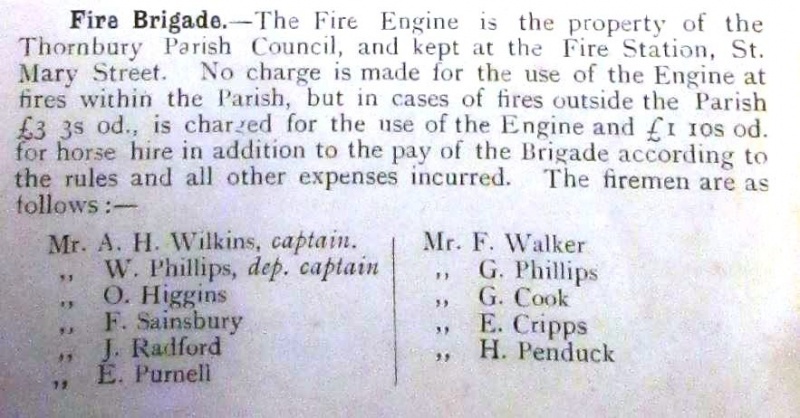 The Rural District Council (who had taken on responsibility for the fire brigade) discussed this and it was suggested that in such cases the firemen should get ‘the practice rate’ paid to them by the council of one shilling per hour. Mr Thompson suggested one shilling and sixpence but this was overruled. 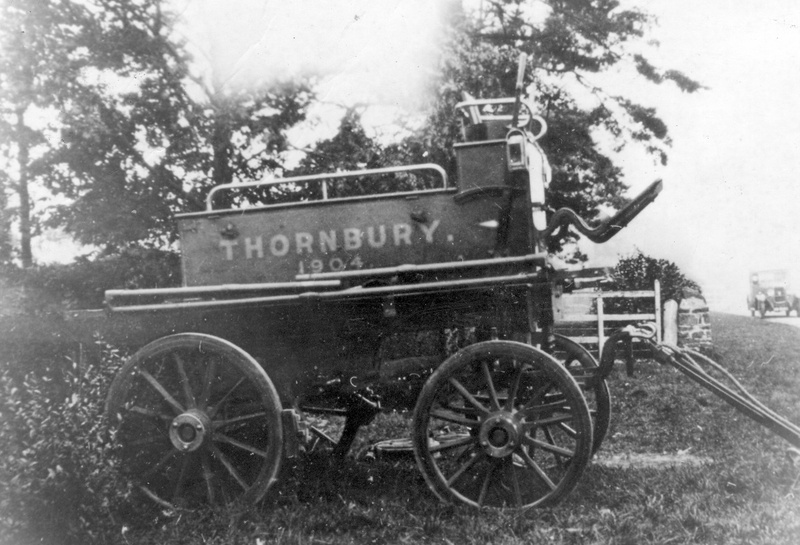 The early history of the fire service in Thornbury indicates that the first problem that the Fire Brigade had to deal with was the water supply. Thornbury had much difficulty in this respect as there was very little in the way of a natural water supply in the town. Read about how and why Thornbury’s water came from the railway. Early in 1898 negotiations were under way with West Gloucestershire Water Company to supply a more effective flow of water to the town’s public hydrants than the supply from the railway. We are not sure that this was ever really achieved as complaints about the supply continued well into the 1950s and we know that some houses in Thornbury were still supplied by “Railway Water” until after 1958. On the Parish Council one of the opponents to the scheme of accepting water supplies from West Gloucestershire was Edmund Cullimore who had very strong feelings about monopolies and did not want a monopoly like the West Gloucestershire Water Company to take over the town. This is interesting from a man who owned so many other monopolies in the town. Mr Cullimore also said that the people of Thornbury were not concerned about fire as their property was insured so it did not matter if it burned down. It is to be hoped that Mr Cullimore took his own advice as his saw mill burned down in October 1899. In September 1898 the Parish Council meeting was attended by Inspector Gotts who was superintendent of the Bristol City Fire Brigade. He said that fire hydrants should be in the principal streets not more than 100 yards apart. He also suggested two moveable standpipes, branchpipes, nozzles, hoses and couplings and a cart with a 30ft ladder. Some of the Councillors appear to have been offended by the recommendations which told them what to do and involved spending more money. The meeting was told that West Gloucestershire Water Company had contracted to supply six hydrants and it was up to the Council to decide where to put them. It was decided to get quotations for the necessary equipment and to have a special meeting of the Rate Payers on 26th September to let them decide. It must have been decided that some equipment could be purchased as the October meeting of the Council was preoccupied by whether the District Council had the power to buy equipment to hand over to the Parish Council for storing it and organising its use. By November 1898 the Local Government Board had conferred the powers necessary to do this. On April 19th 1899 it was reported at the Parish Council meeting that that the fire extinguishing appliances had arrived and could be tested that week. The district council had found a storehouse for the appliance and one storehouse key would be held by their surveyor and the other by the Parish Council. Presumably arrangements were made to access these keys should a fire occur! It was resolved to accept the offer from Mr Stafford Howard of Thornbury Castle of his hand fire engine and ‘that it was desirable that a fire brigade for the town be formed‘. Messrs Bevan, Canning, Pitcher, Tucker and Stone were appointed as a fire brigade. On 20th May 1899 the Clerk of the Council reported that the District Council had stored the fire extinguishing appliances in a shed for which they were to pay £4 per annum to Mr Gilbert Symes. We believe that this shed would have been one of the outbuildings behind Gilbert Symes’s shop and forge at 8 The Plain. Problems regarding which local authority was responsible for the fire brigade and what area was to be covered began to dominate the discussions. At first there was an unsatisfactory compromise. In August 1899 the District Council agreed to allow the fire engine belonging to the Parish Council to be stored in the same shed providing the Parish Council paid half the rent. The fire appliances belonging to the District Council were only available for use in the special drainage district area of the parish. There was some discussion on this restriction and the committee appointed to form a fire brigade were requested to report on the whole question at the next meeting. This seems to have been resolved by September 26th 1899 when the parish council reported that the District Council had been paid and the appliances handed over to the full control of the Parish Council. By this time Edmund Cullimore had decided to reconsider his views about the water supply and wanted a better supply in the fire hydrants in the town. In November 1899 it was reported that Mr Toulman of Wotton under Edge had met with the brigade at Thornbury Castle and instructed them in the use of the appliances and on his suggestion officers had been chosen for the brigade. The question of equipment was discussed at some length and on the motion of Mr George Tucker, seconded by Mr James Bevan, the committee was authorised to ask for subscriptions of the townspeople to provide funds for the equipment of the brigade. In that same month the Fire Brigade Committee was also able to consider the lessons learned from the major fire at the saw mill. Mr Edmund Cullimore whose saw mills were recently destroyed by fire said that he would like to know whether the brigade knew where the fire plugs were placed in the town, who kept the keys and whether there was sufficient pressure of water in the mains to extinguish a fire. When his saw mills were burning no one knew whether they could have the water or how to set about using the appliances. One half of his saw mills could have been saved if they had known these basic things. The Clerk of the Council explained that the Brigade was then only in the course of formation, and they were in doubt as to the use of the West Gloucestershire Company’s mains but that had now been satisfactorily arranged. On February 17th 1900 a proud moment in the history of the Fire Brigade in Thornbury was announced. “The recently formed Fire Brigade under the captaincy of Mr Wilkins appeared before the council attired in their new dress and helmets. The Chairman congratulated them upon their smart appearance and trusted that should a fire break out in Thornbury they would justify the good opinion formed of them. He recommended the brigade to practice in their uniforms so as to get thoroughly used. We believe that the thumbnail image here on the right was taken at about this time and it shows the fire brigade practising at Thornbury Castle. Note that they are using the original hose cart. Please click on the image to see the larger photograph. On the 12th July 1900 the Weston Daily Press reported that Stafford Howard had offered the use of part of the former Market Hall building in the High Street for the storage of the fire engine and apparatus. We understand that Gilbert Symes’s shed was too small and the brigade needed larger premises. We have a photograph of this building with the words ‘Fire Station’ painted on one of the doors. We believe that they continued to use this building until about 1910 when Mr Weatherhead bought the Market Hall for part of his store. From that time until 1931 when the new purpose built fire station was built Thornbury fire brigade used the old malt house in St Marys Street. It is interesting to read how Thornbury’s fire brigade was summoned, bearing in mind the fact that they were retained firemen with full time jobs of their own. We know that eventually the telephone system was used to alert them to a call to duty. Oliver Higgins was a fireman for a number of years, and became brigade captain in 1927, before resigning abruptly eighteen months later, probably as the result of internal differences of opinion. We have found on the internet a reference to the fact that Dursley had a fire fighting appliance that was kept near the Parish Church as early as 1799 and that Dursley Parish Council Fire Brigade was established in 1873. We have not yet found specific information about the appliances available in Thornbury, until long after this date. It seems most likely that owners of large properties made their own arrangements. We have some instances that support this theory. In June 1847 when “The Park”, a large house in Thornbury off the High Street, was advertised for sale a selling point was that on “top of the house is a Forcing Pump to convey water in case of fire etc.” In 1899 Mr Stafford Howard of Thornbury Castle offered to give Thornbury Parish his hand fire engine, which implies that one had been kept at the Castle. As can be seen in the photograph above the fire fighting equipment that the Fire Brigade in Thornbury had at its inception in 1899 was very basic – just some hoses and a cart and very little else. This appears to be the same fire equipment given them by Mr Stafford Howard of Thornbury Castle. 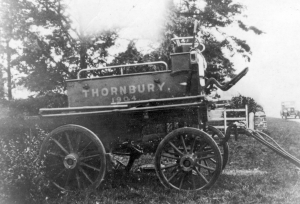 On 13th November 1901 Thornbury Parish Council discussed the issue of the purchase of a manual fire engine, something that the Fire Brigade Committee had twice recommended, together with 40 feet of leather hose. Mr Till said he had conversed with several ratepayers and that they were of the opinion that such an engine was not required. Mr Whitfield thought that the opinion of the ratepayers should be obtained on the question of the expenditure. The meeting decided that the question should be put before a parish meeting. In 1904 the Parish Council purchased a 22 man manual engine. This was a lot of work and 40 men were needed in relays to keep the engine going. Two horses were also required to pull it. This engine (with its date proudly displayed) can be seen by clicking the thumbnail image on the left. With all that manpower required it is no wonder that in January 1913 the newspaper reported the chairman of the fire brigade committee as saying that they would like “at some future date” a steam fire engine which would be more easily worked. However we have no record that this was ever supplied. The same newspaper article reported equipment that the fire brigade actually did receive at the cost of £20. This was mainly in the form of clothing. It seems that the majority of the boots worn by the firemen were part of the original issue in 1900. The Council decided that one pair could be replaced and the rest mended! It was felt necessary to buy six new tunics and trousers to match the members tunics. It was also felt advisable to buy new headlights for the cart. The trade directory published by Albert Prewett of the High Street in Thornbury in 1915 shows that the fire brigade was forced to charge for visits outside the parish. Please click on the image on the right to read more. In 1920 it becomes clear that although the Fire Brigade had a horse drawn cart it had never had its own horse. This led to a crisis which was reported in the newspaper of April 1920 when Mr Samuel Pegg left town and the fire brigade could no longer borrow his horse. It seems they had been paying him a retainer of £5 a year for this service and now the fire brigade would have to “acquire a horse.” Probably they still had not actually bought their own horse as in July of 1927 it was reported that Mr Phipps was no longer prepared to take the fire engine and equipment to the scene of a fire. On 9th December 1922 another problem was highlighted when the fire service was reported as saying that the hose pipe bought over 22 years ago was very unsatisfactory and they were thinking of buying three new 100 feet long hoses with fittings. It was also reported in 1927 that the fire brigade wanted to take another big step and buy a motorised fire engine. About 1930 Thornbury Rural District Council took over responsibility for the fire brigade and provided modern motorised equipment and a new fire station was built.